Autograph Free Front, London. 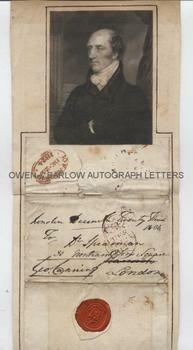 December 23rd, 1824. 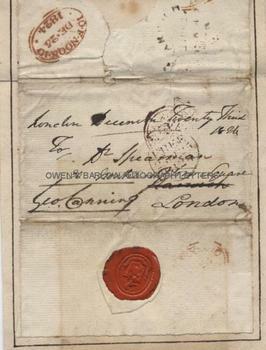 Signed by George Canning, dated and addressed in his hand to Dr. Spearman, 30 Northampton Square, London.With Free Frank stamps and the stamp of the receiving post office (10 F[ore] Noon, De[cember] 25, 1824). Also bearing his red wax seal, impressed with his heraldic arms. Mounted by the original 19th century collector with a contemporary steel-engraved portrait of Canning. 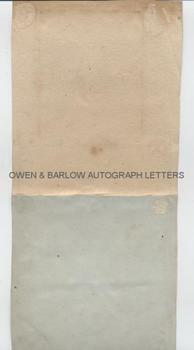 Laid down on a folded card measuring approx 12 x 5.5 inches. Mounting traces on verso. Some creasing and browning but generally very good. 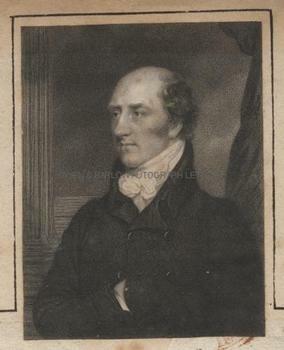 George Canning's term as Prime Minister (10th April to 8th August 1827) was a short one but he also served in two of the the other great offices of state. He was twice Foreign Secretary (1807-1809 and 1822-1827) and also held the office of Chancellor of the Exchequer whilst Prime Minister.